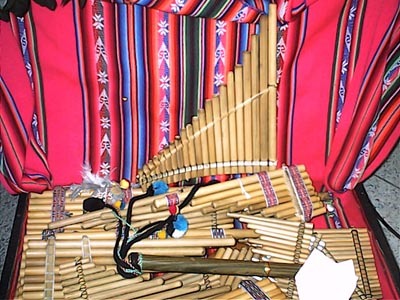 The Pauflutes of "The Imbayakunas"
Marcelino Vega of the Imbayakunas. 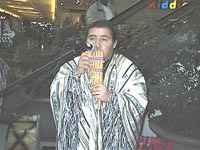 From the Quinchuqi, rural community located on the foothill of the Imbabura mountain, Ecuador, The Imbayakunas came to tour Ottawa's Malls and streets bringing with them native music from the Andes and the traditional music instruments ronador, pauflutes, drums and cajas. Imbayakunas stems from Imbayacuna, which means strong people, determined people. 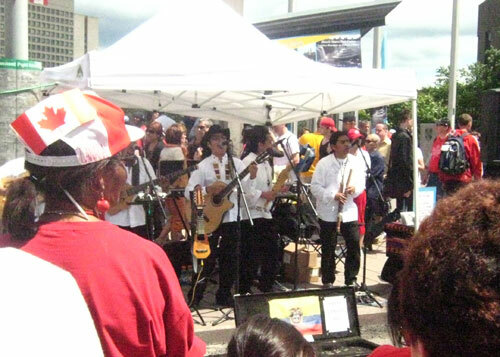 Folkloric music from the Andes (Ecuador, Peru and Bolivia) is the privileged expressionof 20 million Quechua and 4 million Ayrnaras. The tempo of the music has a wide range, some songs are somber and pensive whileothers are very lively and upbeat. The songs are sung in Spanish and also Quechua.Themes of the songs are of respect for "Pacha Mama" (mother earth in Quechua),annual Andean festivals, working overseas, love and new romance. The band continues to perform on Every Canada Day for the past few years.